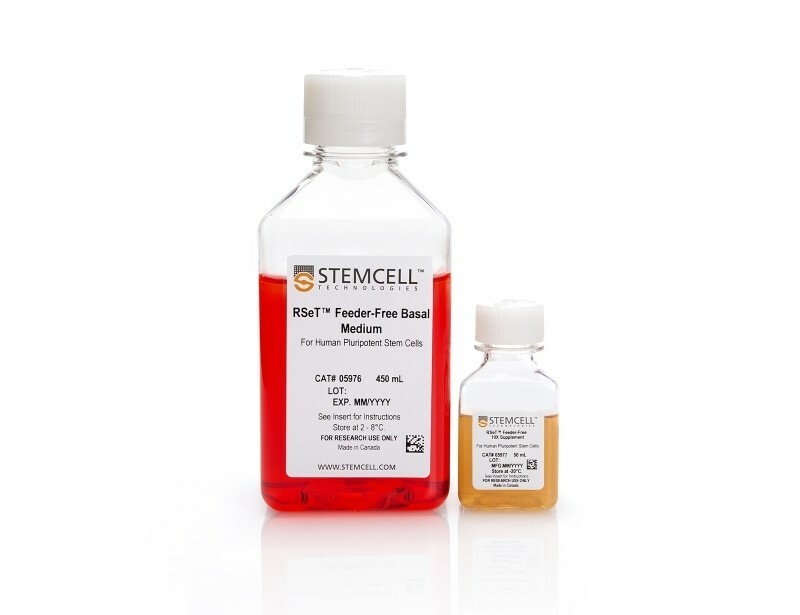 RSeT™ Feeder-Free Medium is a serum-free cell culture medium used for the reversion of primed human embryonic stem (ES) and induced pluripotent stem (iPS) cells to a naïve-like state and maintains cells in a naïve-like state under hypoxic conditions without bFGF or feeder cells. RSeT™ Feeder-Free Medium was developed under license from the Weizmann Institute of Science. With pre-screened quality components that ensure batch-to-batch consistency, this medium produces robust cultures with features of a naïve-like state such as tightly packed, domed colonies with refractive edges. 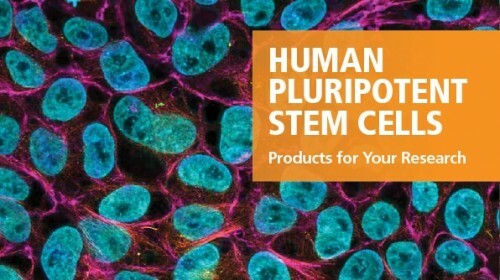 Key transcripts associated with naïve-like human ES/iPS cells, such as KLF17, KLF2, KLF4, and TFCP2L1, show increased expression in human ES/iPS cells cultured in RSeT™ Feeder-Free Medium. RSeT™ Feeder-Free hPSCs can either be differentiated, or converted back to a primed state by culture in mTeSR™1 and then differentiated. 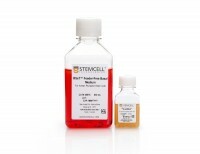 Products that can be used for differentiation include STEMdiff™ Definitive Endoderm Kit (Catalog #05110), STEMdiff™ SMADi Neural Induction Kit (Catalog #08581), and STEMdiff™ Mesoderm Induction Medium (Catalog #05220). Primed hPSCs are plated as aggregates in mTeSR™1. On day 1, mTeSR™1 is replaced with RSeT™ Feeder-Free, the cultures are transferred to hypoxic conditions, and the medium is exchanged every other day. By day 4 or 5, the colonies are generally large enough to be passaged. During the initial culture in RSeT™ Feeder-Free, colonies expand and begin to adopt a tightly-packed, highly domed morphology characteristic of naïve-like stem cells with smooth and refractive colony edges as early as passage 1. (A) A representative image of hPSCs that reverted to a naïve-like state after being cultured in RSeT™ Feeder-Free for 1 passage. 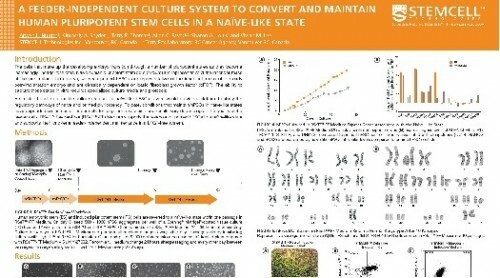 During reversion, colonies change from a flat morphology to a domed morphology characteristic of naïve-state hPSCs. (B) Expression of naïve-associated genes (KLF2, KLF4, KLF17, TFCP2L1, STELLA, and DNMT3L) in hPSCs that were reverted to a naïve-like state in RSeT™ Feeder-Free. Expression levels were measured by qPCR and normalized to levels in primed hPSCs.